President Rodrigo Duterte's tirades against the Roman Catholic church may be proving itself successful in rooting out the Filipino's centuries-old imbedded blind devotion to the institution, as well as the grip that the Liberal Party has on it, said blogger benign0. "Recall that the Yellowtards seized power in 1986 backed by the influence gratitiously dispensed by the Roman Catholic Church. It would seem that the days of this conjugal grip on power by the Yellowtards in partnership with the Catholic Church is coming to an end." In his article posted in GetRealPhilippines, benign0, the anonymous yet known writer, said that while there remains a vagueness as to the long-term effects of Duterte's words, but his feud with the church is him leaving a mark, for such has never been done before. "Indeed, the irony that escapes the huffing and puffing stalwarts of the Philippine Opposition led by the Liberal Party (a.k.a. the Yellowtards) is that the big waves Duterte’s attacks on the Catholic Church have caused actually highlight just how deeply-entrenched a grip on Philippine society the Church enjoys. At the very least, the fact of this very grip should prompt a bit more objective scrutiny into the real nature of the effects of this disproportionate influence on Filipino behaviours and attitudes wielded by a single organisation — and one that answers to a foreign government, no less." Benign0 then recounted how Christianity, a religion which was major in Europe, was used by Spanish colonizers to manipulate the native Filipinos. Friars, he said, raped women and used God to abuse our countrymen. However, he noted that even if Filipinos are devoted catholics, aside from the usual noise in social media, the response that are against Duterte's remarks against the church are weak, disappointing, he said, the Liberal Party who are against the President. "If, indeed, Duterte manages to break the back of the Roman Catholic Church itself and end the vast blanket emotional blackmail it had been subjecting Filipinos to for centuries, he will have dismantled a major vestige of imperial rule over Filipinos. Within more recent history, he will also have taken down a key pillar of the Yellowtards’ power structure," he said. He said that such fact is an achievement at par with any other major reformist movement in the annals of human history. "The Philippines has long been renowned for the voodoo flavour of its Catholic practice — something the Catholic Church has done little to change (and, in fact, has encouraged it). As such, the Catholic influence in Philippine society has long been recognised as a significant contributor to the backwardness of Philippine society. It panders to the poor, does not encourage self-reliance and personal accountability, and emotionally-blackmails the rich to dole out their hard-earned surplus wealth to the “less fortunate”. Such is an environment created by Catholic teachings that encourages mendicancy and mediocrity to thrive and personal excellence and focus on achievement to take a backseat to these," he said. 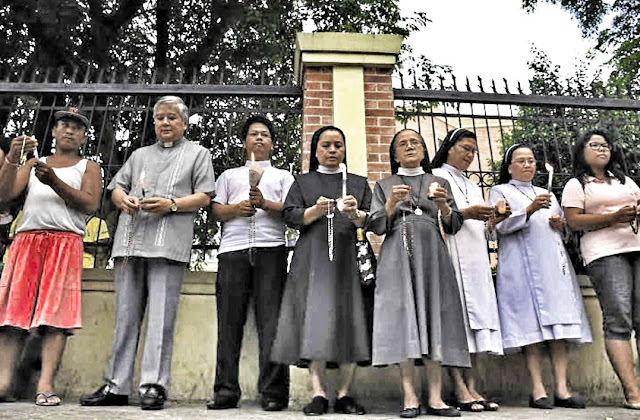 "One can only hope that this rare opportunity to take the Philippines’ Roman Catholic Church to task is finally taken. The fruits of this opporuntity hang low and Filipinos only need to get up off their asses and reach for them," he added.